Shape of foodstuff is kept neatly by semi-sphere. 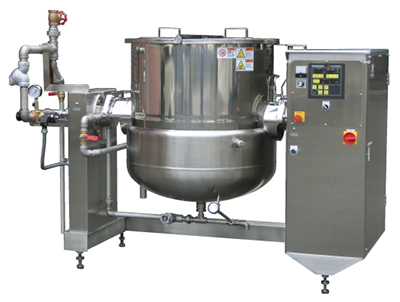 With semi-spherical kettle that allows ingredients to flow naturally and proprietary mixing blades designed to take the physical property of various food into consideration for better folding effect, this machine is capable of gently mixing food, especially the sticky types, and delicate products such as tsubu-an (coarse red bean paste) without damaging them. Has superior safety compared to gas heating due to centralized management of heat source and ease of maintenance. Max. steam working pressure of up to 0.294MPa makes it suitable for high temperature cooking (also capable of handling high pressure steam). All stainless steel finishing imparts superior durability, which makes it easy to clean and hygienic. Product temperature sensor/timer come as standard installation. Self weighing system (option) is a device for controlling the cooking process by weight. With this, you can obtain consistent products without variations between batches. Various type of bean paste, Jelly, Jam, Marmalade, Custard cream, Fondant, Filling, Stew, Roux, Various Japanese dishes (Tsukudani, Denbu, Kinpira), Cream croquette, Peanut cream, Sauce, Soup, etc.